Have you ever wondered about those red bumps on your upper arms, thighs and other parts of your body that do not budge at all? Most of us tend to presume it as an acne. But, actually it can be from keratosis pilaris. Keratosis pilaris, commonly known as chicken skin, is a common skin disorder. It is characterized by small, red, acne-like bumps on the upper arms, buttocks, legs and cheeks that are mostly dry, rough and itchy. Here is the infographic by “www.fabhow.com” which shows the methods to get rid of it. 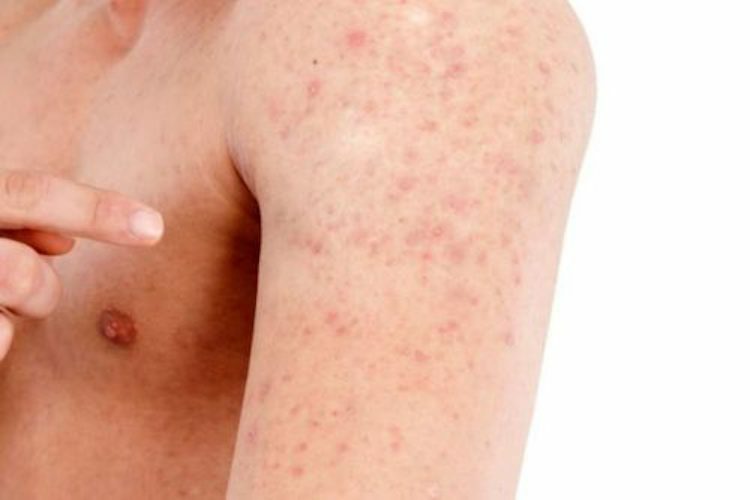 Keratosis pilaris skin Treatment is a must! Do not use soaps for cleaning the skin bumps or rashes. It may dry out the skin and make the condition worse. Consume foods rich in vitamins C and E.
Always use a moisturizing cream or lotion if you live in a dry and cool area. One can go for Revitol acnezine solution as it helps in curing Keratosis. Drink distilled and pure water. Tap water contains chlorine, lead and nitrates that can worsen the condition. Do not use very hot water for your shower or bath.